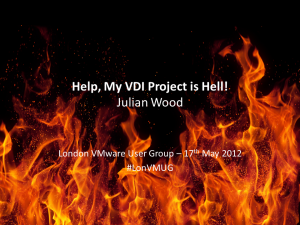 Today I have the pleasure of talking at the London VMware User Group. My presentation is called Help, My VDI Project is Hell! There are many complexities with VDI projects causing many to fail at the planning stage, at the POC or testing stage or even worse during the implementation phase. I go through some of the Magic Fixes that VDI is meant to solve and what the reality often turns out to be with all this new technology you need to consider. Looking at some research stats, many companies are doing VDI for the wrong reasons with many thinking they should do VDI to save costs and then realising this often isn’t the case. VDI is great for many use cases, remote connectivity, security, quicker provisioning, containing your VM info, maybe availability, maybe easier management but can be also terrible in many circumstances with performance, user experience, cost, peripherals, licensing, flexibility, support and general complexity issues. I then go through the 3 things you need to work out, your strategy, your apps and your users. VMware has released a new Emulex be2net driver version 4.1.334.0 for both ESX(i) 4.x and ESXi 5.x for the Emulex OneConnect 10Gb Ethernet Controller which is used in HP G7 Blades. But, before you get too excited, HP has NOT certified these drivers for use with HP Virtual Connect and FlexFabric…I think. This page however from VMware says for ESXi 5 driver version 4.0.355.1 isn’t supported for HP ProLiant G7 servers. It requires a new firmware version that is not currently available.